and Wesley Whitson in Twelfth Night. By now, many of you have witnessed Twelfth Night on the Alley Stage and watched resident company member, Chris Hutchison, play the role of Orsino. Chris adapted to a new workout regimen to prepare for his role as Orsino in the Alley Theatre’s season opener, Twelfth Night. Read on as Chris takes us through his process, and how he had to take it up a notch in the gym. Describe what you went through to prepare for your role as Orsino? Shakespeare always requires a little something extra from the intellect, and demands a lot of rigor outside of parsing the text, making it crystal clear to yourself, ultimately ensuring you can deliver the thoughts and poetry clearly for the audience. Physically, depending on the role, you really need to be in touch with your breath and lungs so you can have what you need to get some of the longer thoughts out without breaking them up. That stuff aside, I went the extra mile this time around with regards to my body. I have always had decent discipline - kept a regular workout schedule every other day, four days a week- but I had to increase it to every day for this role. Every other day, my workouts are longer, with short, intense workouts in between. Additionally, I have radically altered my diet for the first time ever really! More on that below. I heard that your wife, Elizabeth Bunch, joined you on your fitness journey to prepare for her role as Olivia, how did that help you along the way? 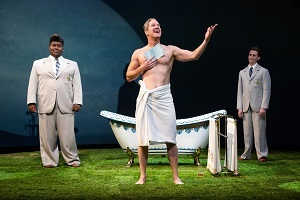 We spent a few days over the summer working on the play with director, John Moscone, and he mentioned that I would be making a pretty grand entrance in a tub. I thought it might be a good idea to get ready for what would happen when I GOT OUT of said tub! Elizabeth, as is so often the case, was my original inspiration! A few months ago, in a happy accident of timing when this process was still pretty far away, she asked if I would be interested in taking on one of the current "lifestyle challenges" that are popular right now. She thought I would have needed some convincing, and was surprised when I immediately said, "I'm in!" It fell right in the perfect spot on the calendar to prepare for this show. The challenge itself was pretty compelling to me (mostly about learning and recognizing what our habits are and working from there) and this all comes at the right moment. So we are in it together, encouraging and supporting each other in the challenge. How did getting ready for this role differ from your usual preparation methods? In many ways-no booze! no dairy! no wheat or grains! no added sugar! Seriously though, I always thought that I ate pretty healthily, and that I am moderate in most things that can slow you down mentally or physically. Now I know what it really means to eat healthy! And how to be aware of things that are habit more than necessity. The shift in my energy and its consistency has been the biggest revelation, and has suited me well both onstage and as a dad to two boys under 10! What was your favorite part of this process? Least favorite? Shakespeare is always humbling - a big learning experience for me, a little bit scary, and an unmatched joy when I start to "crack the code" of the character. The entire production experience has been uplifting. It felt like the start of a new Alley era. We had a wonderful cast including young, local talent, and we all felt supported by each other, and the rest of the Alley family. The hardest part has been the "doubling up" that many of us had to do. It has been kind of fascinating really, but due to last year’s floods, the schedule was pretty whacky during the spring into the summer. This meant that most of the company members in this show have been overlapping shows for about 7 months. For example, while performing say Picasso at the Lapin Agile in its final two weeks, the first six hours of the day would find us rehearsing the next show (in that case Holmes and Watson). It has been mostly kind of wonderfully exhausting, but when doing Shakespeare you want to savor it and luxuriate in it, and we had to kind of put that aside early on which can be just a little disappointing. We would just get going in rehearsal, and then we would have to stop, eat, put on a bunch of wool clothes and spend the evenings snowed in in the English Countryside, trying to figure out who killed Mrs. Boyle in The Mousetrap! Sometimes, people get hooked on their new fitness plan. Now that you’ve established this workout regimen/diet, will you keep it up once the show is over? I think I will incorporate a lot of this stuff moving forward, now that I know what it takes and what to expect. The challenge is positive because inside of it you can earn "indulgences" and treat yourself, and the idea is not to become Spartan, but just to put some thought into your day to day routine. It has been a great reset for me personally. If you don’t plan to keep it up, what are you most looking forward to as things go back to normal? Even if I stay with this routine, I am going to celebrate my accomplishment with a big bowl of Pho and the hoppiest IPA I can get my hands on!